Thomas Mann, fascinated with the concept of genius and with the richness of German culture, found in Johann Wolfgang von Goethe the embodiment of the German culture hero. Mann's novelistic biography of Goethe was first published in English in 1940. 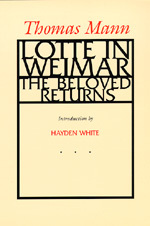 Lotte in Weimar is a vivid dual portrait—a complex study of Goethe and of Lotte, the still-vivacious woman who in her youth was the model for Charlotte in Goethe's widely-read The Sorrows of Young Werther. Lotte's thoughts, as she anticipates meeting Goethe again after forty years, and her conversations with those in Weimar who knew the great man, allow Mann to assess Goethe's genius from many points of view. Hayden White's fresh appraisal of the novel reveals its consonances with our own concerns. Hayden White is Professor of History of Consciousness, University of California, Santa Cruz and author of The Content of Form: Narrative Discourse and Historical Representation, Tropics of Discourse: Essays in Cultural Criticism, and Metahistory: The Historical Imagination in Nineteenth-Century Europe. Thomas Mann (1875-1955), winner of the Nobel Prize for Literature in 1929, wrote essays as well as some of the great fiction of the twentieth century, including Buddenbrooks, The Magic Mountain, Death in Venice, Joseph and His Brothers, and Doctor Faustus.